Are some football managers experts in collaboration? I love football. I love Arsenal lead by the enigmatic, wily Frenchman Arsene Wenger, who said many years ago, "The intelligent player realises the team is the real star". And those of you who follow football around the world know that despite a long trophy drought, most football fans, commentators and pundits agree that Arsenal plays the most attractive form of football in the English Premier League. In fact, very much on par with with Barcelona, who tend to buy a lot of Arsenal players. Now there's some research to support this pearl of wisdom but first some background. One of the key discoveries so far of Complexity Theory is that co-operative processes in general seem far more likely to survive than isolated, rampantly selfish entities. This moves successful evolution away from the original 'principle of natural selection' to a more holistic, symbiotic view of adaptability, wherein survival is a group or team effort. Scientific American recently published research suggesting there is a Surprising Problem with Too Much Talent. "Researchers looked at three sports: basketball, soccer, and baseball. In each sport, they calculated both the percentage of top talent on each team and the teams’ success over several years. For both basketball and soccer, they found that top talent did in fact predict team success, but only up to a point. Furthermore, there was not simply a point of diminishing returns with respect to top talent, there was in fact a cost. Basketball and soccer teams with the greatest proportion of elite athletes performed worse than those with more moderate proportions of top level players. Why is too much talent a bad thing? Think teamwork. In many endeavours, success requires collaborative, cooperative work towards a goal that is beyond the capability of any one individual." The most fascinating insight is how baseball is one game where too much talent is not a problem as it does not rely on nearly as much team cooperation because it's a game where fundamentally of one player against a whole team (not unlike cricket). Read the whole thing. If you think about it, with hindsight our social history is almost embarrassingly about collective effort, rather than individual triumph. If you're an Arsenal fan you'll know that we often say that "Arsene knows". His nickname has been 'The Professor' in the past, even though he makes the most inexplicable, often infuriating decisions about the team and his players. Has he been ahead of the game all this time? Is doing better with less the next big thing in collaboration? Social Media Week London. Do you have influence without authority? It's hard to make any kind of assessmemt about the content at Social Media Week in London because I was only there for a few hours. Lee Bryant from PostShift, Eva Appelbaum from the BBC and yours truly from Sei Mani hosted a panel discussion on how social media teams that 'face outwards' can 'face inward' using their knowledge and insights to influence their organisations in changing the way they work. After all, if customers are organised in networks then companies have to find ways of being network centric as well. Judging by the questions and reactions on Twitter it seems that 'agents' working at the coal face feel a little powerless in their ability to influence internal social collaboration and perhaps underrate the value they can bring to their colleagues. The venue was very 'underground' and quite edgy and very well managed. Well done to the conference organisers. My message was that social media teams do have influence even through they lack the authority in terms of traditional power and there are some simple things they can do exercise that influence. PostShift's after party was brilliant and here's a summary of the short talks some of us gave there. Is WhatsApp disrupting the telecoms industry? 55 employees when sold to Facebook -- that's a price of $375 million per employee! Competition that kills isn't pre-announced, it catches an unsuspecting incumbent by surprise. It's one of the main reasons why the ROI of social collaboration in large enterprises is that you get to exist in 5 years' time. Too few executives really understand this. In general, my experience of participating in online communities over the last ten years is that despite the initial dominance of male members the posture, attitude and expression of these communities are predominantly female. By this I mean people are genuinely welcoming, offer unsolicited benevolence, guidance and assistance and freely give the most valuable thing that anyone can give; their time. This isn't normal for other types of patriarchal organisations. Recent research by academics using large Facebook data sets concluded that both males and females direct 60% of their profile viewing activities to female users. The network is most definitely female. How valuable is Twitter's heartbeat? Amazing analysis of 500m Tweet by SGI Global in an attempt to monitor the heartbeat of a nation in real time in terms of their feelings and sentiment. In this case, the outcome of their voting preferences in the US presidential election in 2012. Spot the difference? Inspired by the folks at Gartner. Big thank you to Fran, Justin and Ben for inviting me to talk at the Social Media Leadership Forum to debate: How can senior executives best use social media to communicate with stakeholders? Here's my take on the subject in 90 seconds! Can't wait to see Don Tapscott (my hero!) talk on the same subject later this year at the Social Media Leadership Forum. Fascinating article from the Economist: The future is another country. "Despite its giant population, Facebook is not quite a sovereign state—but it is beginning to look and act like one"
Thomas Power said to me last year that he thought Zuckerberg was trying to 'put the internet into Facebook'. He could well be right. Are you an Explorer or a Map Maker? Shameless self-promotion. LinkedIn hit the 100 million member mark in March 2011 and CEO Reid Hoffman sent a personal email to the first 100,000 joiners suggesting that this group laid the foundations for its exponential growth several tears later, the super connectors who heavily influence the success or failure of the network. I was joiner number 5,471. Those early days in social media were a lot of fun but an interesting mathematician called G.H. Hardy once said: “When the map-makers arrive, you know the real explorers have already moved on”. 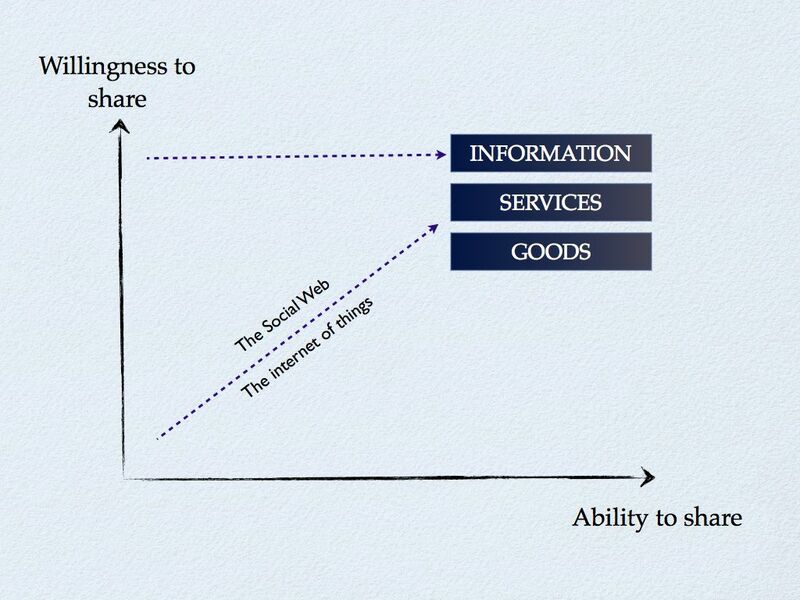 Great post from Patricia McDonald at BBH Labs on the impact of sharing. She expertly describes ways in which sharing is transforming business models summed up by a quote from Wired Magazine's Kevin Kelly. 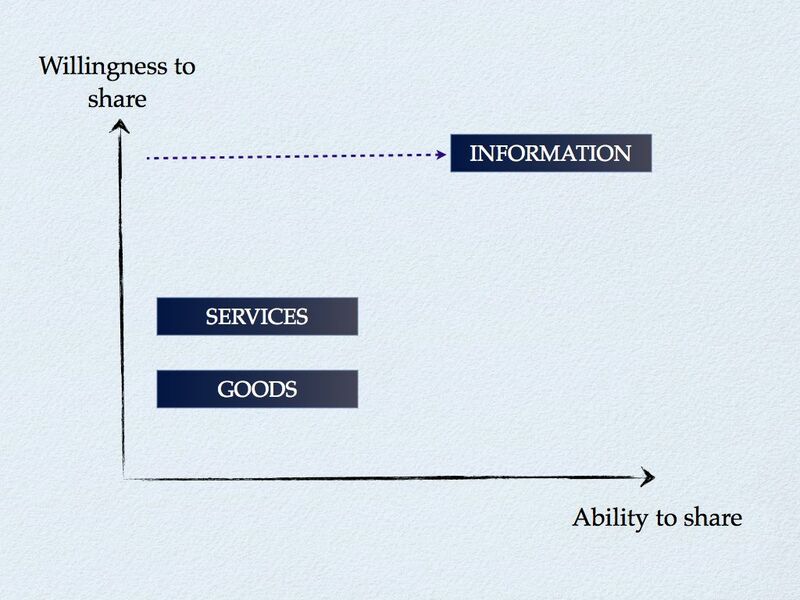 Patricia also points out how the trend for sharing information is spreading into physical goods and services.